Soft Darts for Elite Rampage/Retaliator Series Blasters. 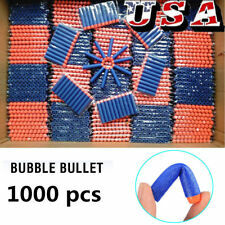 1000PCS Gun Toy Bullet. Note: Bullets only, Toy Gun not included! - Main Colour: Blue. If you do not receive our reply within 48 hours, pls. Soft Darts for Nerf N-strike Elite Rampage/Retaliator Series Blasters NERF A0707 A0709 A0710 A0711 A3844 A0712 A0713 A0715 NERF A0714 CS-35 NERF H34069 A4492ï¼ and Most OF NERF GUNS. Quantity: 200pcs included. Item: Kids Toy. Feature: Hollow. Note: Due to the difference between different monitors, the picture may not reflect the actual color of the item. Colors: Black. Material: EVA. Nerf N-Strike NanoFire Blasters Wave 1. Load 1 dart into the barrel, pull down the priming handle, and pull the trigger to fire. Reload and fire again! Storage for 2 darts on the handle. • Fun and safety: each quick reload clip can keep up to 6 darts, and the hand wristband up to 8 darts. • Elite Darts work with any N-Strike Elite blaster and most original N-Strike blasters. • 40 x Refill Bullet Soft Darts. Compatible: Suitable for Nerf N strike Elite Series. Less Impact: The foam bullets are light and no need to worry breaking things. it enables you load up the firepower at once. Fit for: Elite Rampage/Retaliator Series Blasters. These Darts are specially designed for the new Elite Rampage and Retaliator guns, which features “slam fire” for fast shooting and can shoot darts up to 75 feet with no modifications needed. These darts are specially designed to work with the new N-strike Elite Rampage and Retaliator guns, which features"slam fire" for fast shooting and can shoot darts up to 75 feet with no modifications needed. Inspired by blaster used in Fortnite; detachable barrel; internal clip with 3-dart capacity; includes 6 official Nerf Elite darts; suitable for children ages 8 and up. Dart-firing Fortnite blaster replica. NERF N-STRIKE THUNDERBLAST MISSILE LAUNCHER TOY SOFT DART BLASTER GUN NEW! Nerf N-Strike Thunderblast Launcher. Action Grip to Steady Each Shot! 5 out of 5 stars - NERF N-STRIKE THUNDERBLAST MISSILE LAUNCHER TOY SOFT DART BLASTER GUN NEW! 1 product rating1 product ratings - NERF N-STRIKE THUNDERBLAST MISSILE LAUNCHER TOY SOFT DART BLASTER GUN NEW! Fire and strike fast with the Nerf N-Strike Elite Disruptor blaster! This quick-draw blaster has a rotating drum that holds up to 6 Elite darts. Includes 6 Elite darts. Includes blaster, 6 Elite darts, and instructions. Nice accessory for Rival Apollo, good gift for children. Suitable for Rival Apollo. Quantity: 100pcs. Due to its uneven surface, it can move smoothly in toy gun and won't bring jam. Toy gun is not included. NERF N-Strike Modulus Tri-Strike Blaster Tri Strike NEW IN BOX ! FAST SHIPPING! 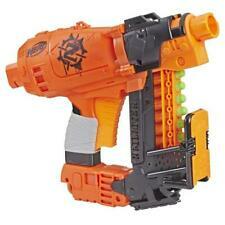 Kids can build their own blaster for each mission with the Nerf Modulus Tri-Strike blaster from Hasbro! Bring an entire arsenal to the battlefield with the versatility and power of the Tri-Strike blaster! 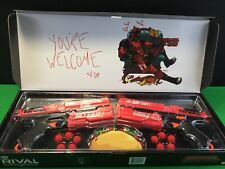 4.5 out of 5 stars - NERF N-Strike Modulus Tri-Strike Blaster Tri Strike NEW IN BOX ! FAST SHIPPING! 9 product ratings9 product ratings - NERF N-Strike Modulus Tri-Strike Blaster Tri Strike NEW IN BOX ! FAST SHIPPING! Trending at $28.64eBay determines this price through a machine learned model of the product's sale prices within the last 90 days. With the full Nerf Modulus system, over 1000 different combinations are possible! Nerf and all related properties are trademarks of Hasbro. Part of the Nerf Modulus system. Includes red dot sight and instructions. Pinpoint targets with the red dot sight on this exclusive Nerf N-Strike Elite Surestrike blaster! Battlers can take aim at the competition with the electronic sight to help achieve a more precise shot. Quantity: 120pcs. Soft bullet darts reduce the impact and protect kids from hurting. It features slam fire for fast shooting and can shoot darts with no modifications needed. 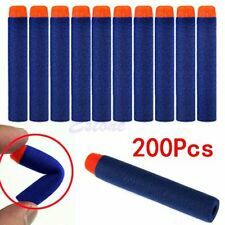 120 Bullet Darts. Type: Dart Guns & Soft Darts. Up for sale is a Nerf N-Strike Elite CS-18 18 Round Dart Drum Magazine. First party accessory. Magazine only. 5" Snub-nosed Revolver Cap Gun. 26" Toy Shotgun Dart. 6" 9MM Pistol Cap Gun - SILVER. √Usage:Unscrew the rear cap, put Nerf Rival foam bullet in, pluck the pin and throw it out just like a grenade. √Material:This nerf grenade is made of the ABS material,which is solid and durable to use. It DOES NOT INCLUDE THE GUN! The first pictures is an example of how it looks on the gun. It also has a glossy finish while carbon fiber has a more matte finish. This mod is just for looks. Compatible with Nerf Stryfe. Blast for distance on the battlefield with Nerf Elite darts. Nerf and all related properties are trademarks of Hasbro.